Starz TV series don’t rule the Nielsen ratings, but since Starz viewers pay for the privilege of watching, the brass only has to worry about pleasing them, not ad buyers. Last year, the Counterpart TV show premiered and wound up ranked fourth out of the network’s original programming. Now that it’s back for a second season, will the audience return or even grow? Will Counterpart be cancelled or renewed for season three? Stay tuned. **Status update below. 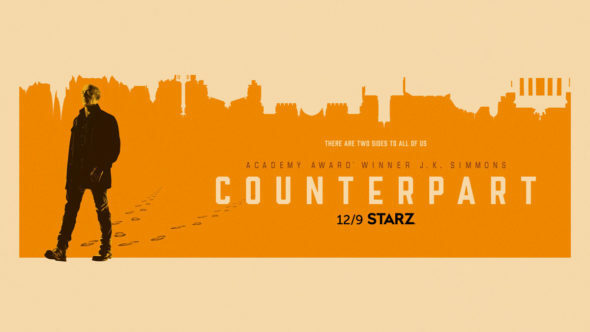 A Starz sci-fi espionage drama, Counterpart stars J.K. Simmons, Olivia Williams, Harry Lloyd, Nicholas Pinnock, Nazanin Boniadi, and Sara Serraiocco. Exploring themes including identity and fate, the thriller centers on a low-level bureaucrat, Howard Silk (Simmons), who toils away in relative obscurity at a United Nations spy outfit based in Berlin, Germany. After uncovering evidence that his agency is protecting a secret about traveling to a parallel dimension, Howard’s whole life changes. He soon plunges headlong into a strange world fraught with peril and treachery. James Cromwell guest stars in season two as Yanek. For comparisons: The first season of Counterpart averaged a 0.09 rating in the 18-49 demographic and 371,000 viewers. What do you think? Do you like the Counterpart TV show? Should this Starz TV series have been cancelled or renewed for a third season? Great show. One of my top viewing picks. I hope someone picks it up. Far too many good Sci-Fy get dumped these days. Sad. Season 3 would go after everything that was revealed in Season 2. Still, we hope it continues to have the chance to intrigue. I absolutely loved the show. It is so increadibly well done. I did not know until today that it had such low ratings, how is that even possible? Well i think i know, i think people dont know about it, i found it when it was season 1 episode 6, i got immediately hooked and binge watched first 6 episodes, i think it needs more advertising because it needs a season 3. Try to get it to Netflix, i think it would get much more attention there, nobody knows about Starz TV. It is a great and very original TV Show, I really really hope they don’t cancel it. Today I saw the finale of the 2nd season, and it was a hell of a fun, and besides leaves the series perfectly open for a season 3. The thing it is that I just for luck start to seeing this, I never knew before about it, so the producers should do more advertisement, because it is a hidden jewel for sure. I really enjoy this program. 10 episodes are a tease. However I cannot wait for season 3. Don’t cancel otherwise someone will steal your idea. Think of Star Trek and how those producers are kicking their butts for taking it off the air too soon. You got a winner here if you just be patient. Next week is the last episode of Counterpart. Based on its ratings, the show has almost Zero chance of renewal. It is a very good show, but that probably won’t matter. The show will not end with any kind of an ending that will(or should) satisfy anyone. Too many things won’t be wrapped up. I would love to see it renewed, but I would be shocked if it was. Yes, renew for season 3! Love this show.